EA has shared its plans for the launch of Battlefield V, and the follow on 'chapters' that will be released, in a blog post. Before we start, it is worth remembering that EA has already pushed back on the launch of Battlefield V - a few weeks ago it shifted from October to a new release date of 20th November. 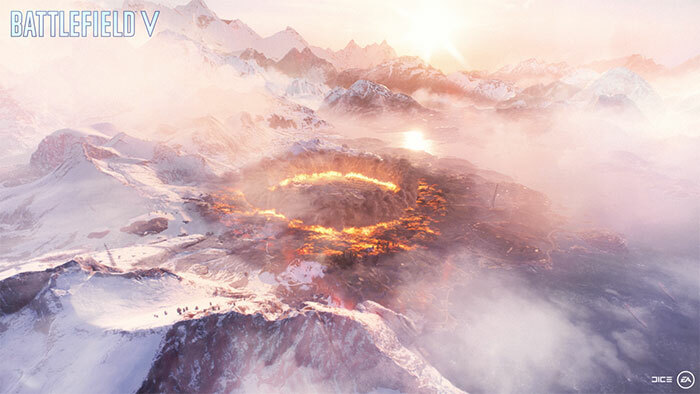 The headlining news today is that the 'battle royale' mode for Battlefield V gamers has been bundled into a third chapter of post-launch content dubbed 'Trial by Fire', which will release from March 2019 onwards. The roadmap overview is reproduced below. It is good to start any tale on a positive note, so EA reminds those interested that from launch day there will be "tons to do" in the game, without thinking about the upcoming chapter and game mode rollout plans. 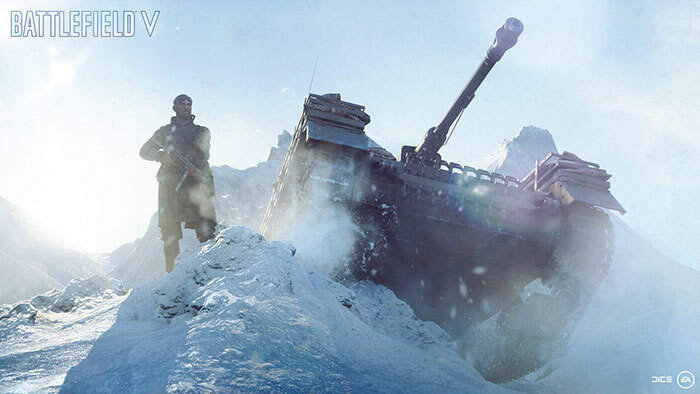 EA says Battlefield V will launch with "eight maps set in frozen landscapes, desert heat, and everything in between, eight exciting game modes, single-player War Stories, outstanding gunplay, a wide arsenal of weapons, vehicles, and gadgets, progression, customization, Specializations for weapons and vehicles, and much more". 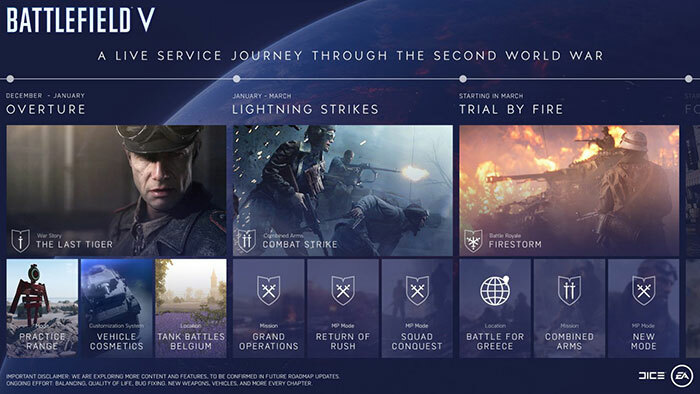 Subsequently the Tides of War live service for Battlefield V will begin with its own chapters, to evolve and expand the Battlefield V experience. Chapter 1: Overture beings in early September and runs through January. It delivers the Panzerstorm map, a tank-focused arena, and suitably you will get to play the first War Story: The Last Tiger. At the same time EA will introduce the initial iteration of Practice Range for Battlefield V. Vehicle customisation options will arrive. Weekly events and rewards begin, based on challenges in the Tides of War episodes and more. Chapter 2: Lightning Strikes runs from January until March. The War Story dubbed Combined Arms becomes available and this time it is based around infantry challenges during which you and your squad fight against various AI opponents. Two new game modes will debut during this chapter; Rush and Squad Conquest. Again there are weekly events and rewards. Chapter 3: Trial by Fire rolls out starting in March, says EA. In this chapter the war reaches Greece as the third Tides of War chapter is based around a map of the Cretan coast where you will join a massive aerial invasion. Spring will see Firestorm, Battlefield V's battle royale experience launch. As you might already have learned, players will be thrust into a shrinking playing field with trademark Battlefield elements such as team play, powerful vehicles, and destruction. EA promises to keep delivering new locations, new weapons, new vehicles, and more - even after the third chapter closes. If you are very keenly anticipating Battlefield V and willing to pre-order, or join one of the EA/Origin subscription services, you will be able to play the game before the 20th Nov. From 9th Nov, those with Origin Access Premier or EA Access and Origin Access Play First Trials can indulge. Those who stump up for the Battlefield V Deluxe Edition early enlister access can play from 15th Nov. Battlefield V is coming to PC, Xbox One, and PlayStation 4. Dullsville. (available almost immediately after launch). It is EA, no ty. The only positive to late BR launch is prices will be lower around March next year along with the game being polished and rounded up abit however it's EA.